Dexid-400 is based on an optimised blend of glutaraldehyde and quaternary ammonium compounds (QACs) in aqueous solution, and combines the powerful broad-spectrum activity of glutaraldehyde with the soil penetrating, deterging and rapid biocidal capacity of QACs. It is a potent, high performance terminal disinfectant formulated for use in poultry hatcheries, livestock buildings and for disinfecting equipment, boot dips and wheel rinses. Dexid-400 has broad-spectrum activity against bacteria, viruses and fungi of importance in the effective maintenance of animal health and hygiene. It is designed as a terminal disinfectant for use after surfaces have been thoroughly cleaned and rinsed to remove all gross soil. Dexid-400 provides control over pathogenic bacteria, mycoplasma, viruses and fungi and their related diseases, such as Newcastle Disease, Swine Vesicular Disease, Avian Influenza, PRRS, Infectious Bursal Disease (Gumboro), Marek's Disease, Avian Encephalomyelitis, Bacillus cereus, Campylobacter jejuni, Escherichia coli, Klebsiella pneumoniae, Listeria monocytogenes, Mycobacterium smegmatis, Pasteurella multocida, Pseudomonas aeruginosa, Salmonella thyphimurium, Staphylococcus aureus, Cladosporium cladosporioides, Geotricum candidum, Candida spp. and Aspergillus spp. - Clean the surfaces with a proper detergent. - After rinsing and drying, apply Dexid-400 at 0.25% (no specific disease; 1:400) to 0.5% (disease outbreaks; 1:200) by spraying (ca. 1 l of solution per 4 m2). For fogging use 1 l + 4 l of water for 1000 m3. - Following the appropriate minimum contact time (typically 20 minutes), areas should be rinsed thoroughly and allowed to dry before animals are returned to the area. - Clean trucks and trailers with a proper detergent. - After rinsing, spray Dexid-400 at 0.5% (1:200). - Rinse after at least 20 minutes of contact time. - For wheel rinses apply Dexid-400 at 0.5%. - After rinsing, apply 0.25 – 0.5% Dexid-400. - Clean the trucks with a proper detergent. - After rinsing, apply Dexid-400 at 0.25 – 0.5%. Dilute Dexid-400 at 0.5% and renew regularly (every 2-3 days; daily for best results). 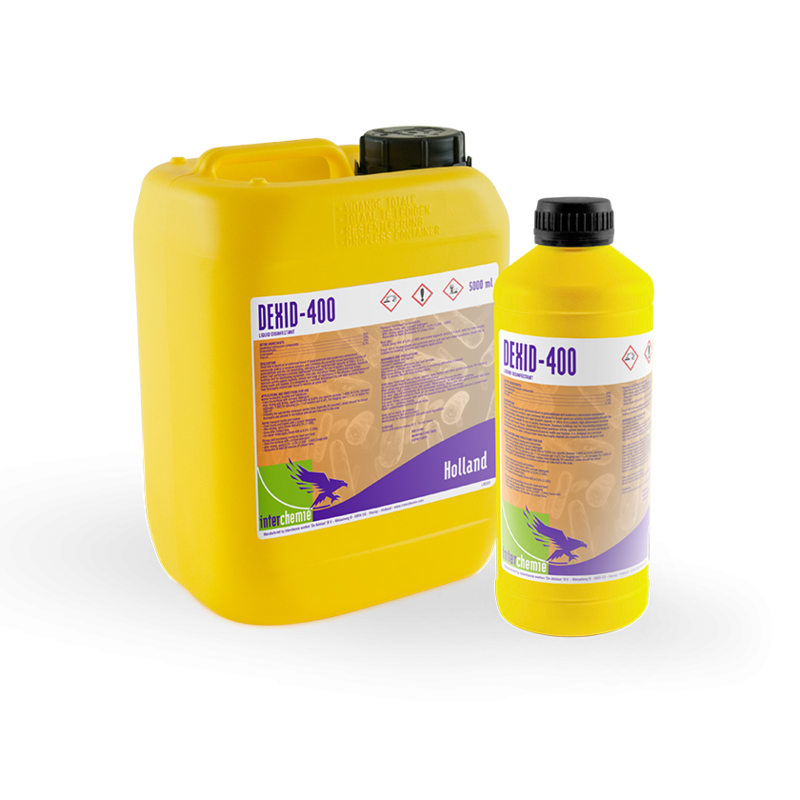 Dexid-400 is suitable for use on all surfaces including soft metals, is biodegradable and performs well in soft and hard water conditions and in the presence of organic matter. Dexid-400 is suitable for soaking, spraying and fogging applications. - Do not apply Dexid-400 in the presence of animals. - Highly flammable liquid and vapour. - Toxic if swallowed. In case of emergency, wash out mouth with water and give 200 ml of warm water to drink. DO NOT induce vomiting. Seek medical advice immediately. - Harmful in contact with skin. - Causes severe skin burns and eye damage. In case of emergency, immediately flood the eye with plenty of water and boric saline solution for at least 15 minutes, holding the eye open. - May cause an allergic skin reaction. - Causes serious eye irritation. - May cause allergy or asthma symptoms or breathing difficulties if inhaled. - Very toxic to aquatic life. - Personal protective equipment, such as gloves, masks and eye protection, should be worn during the mixing or application of Dexid-400. - Containers should be rinsed with clean water and disposed of in line with local regulations. Bottle of 1 litre, jerrycan of 5 and 10 litres and drum of 200 litres.